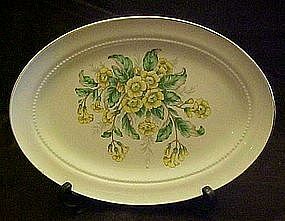 Not sure exactly who did this oval platter, it is not marked. Though it has the matching sugar bowl in the shape of Hall China, it has the exact buttercup decoration of the Edwin Knowles buttercup pattern ony a single spray of flowers instead of three. Anyway.... it is sunny and bright and in excellent condition with no chips or cracks. It measures 11 1/4" long and would fit in beautifully with your Edwin Knowles Buttercup set. Gold edge trim.